The cost of flying to Europe and back on the major airlines keeps many would-be travelers home. Here are a few tips for going there less expensively. Obtain an airline credit card. My round trip flight to Europe earlier this year cost only $50.65. My American Airlines credit card enabled me to use frequent flyer miles to pay for my flights. All major airlines offer 30,000 or more “miles” for new customers. There are a few strings attached and the interest rates and fees are very high but used wisely, these cards can be an excellent bargain. A website called “The Points Guy” is famous for telling how to maximize this option. Wow! A low cost Icelandic airline named WOW flies from Newark, Boston and Baltimore to Europe at very low rates. Their original $99 offer seems to have disappeared but there are one-way flights from BWI (Baltimore/Washington DC) to Iceland for as little as $199 and to continental Europe for as little as one way $229 (BWI to Paris Charles deGaulle airport). The cost of a return trip may be higher. WOW allows stopovers in Iceland at no extra charge on flights to Europe. Here’s an article from USA Today that provides detailed (but now slightly dated) information about this airline. Norwegian Air Shuttle is another airline offering even lower cost flights to and from Europe to selected U.S. airports. Check their fares at their website. As with any low-cost carrier, expect additional charges for many necessities. Read the website and ticket information thoroughly before booking any flight. An Irish Connection: A combination of a trans-Atlantic flight on Aer Lingus, the Irish airline, and Ryan Air, the Irish low-cost carrier serving much of Europe from Dublin, is the best way I know to enjoy a comfortable flight while saving hundreds of dollars. Ryan Air fares can be as low as 29 euro. To keep fares low Ryan Air often lands at secondary airports quite a distance from major cities so include the cost of getting to your final destination when calculating any savings. Repositioning cruises. Every spring and autumn many very large cruise ships are moved to or from Europe. The trip takes five days or longer — five days or more of good meals, free entertainment, total relaxation. The fares for these cruises are quite low. Choose from Celebrity, Princess, and all the other big-name cruiselines. If you have sailed with one line frequently you may receive a greater discount or other perks. Calling a travel agent to arrange this trip for you costs you nothing and makes the process much easier. Combine your cruise with a discounted flight home from one of the airlines mentioned above for maximum savings. 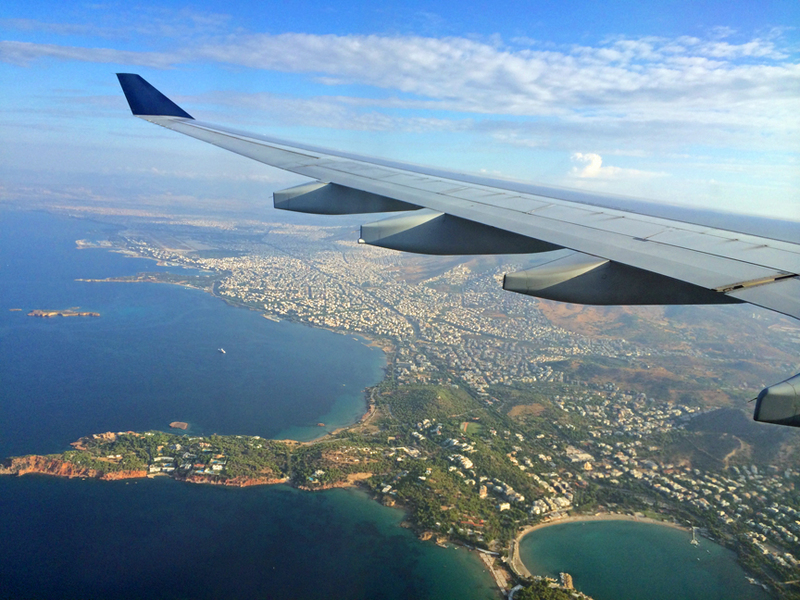 Here’s a blog entry with several helpful ideas for saving money on flights. The photo at the top was taken just before landing in Athens.